I’m always looking for shortcuts and ways to use up odds and ends that I have in the kitchen. Because of that some times, I throw together random ingredients that just seem to work together. This recipe was one of them. I made a batch of brown rice over the weekend, and I had a plastic container of it sitting in the fridge. I also have a new jar of ancho chile powder left from the Mayan Harvest Bake. Chile powder and rice just screams for lime and garlic to make it a Mexican or Cajun theme, so I went with it. Adding the diced zucchini to the rice added a bunch of volume and also gave it a pretty color to blend with the red tomatoes and yellow corn. Some things that I try to do when making meals is to look for colors, flavors, and textures and try to include several of each. It makes meals fun and if they’re fun, there’s a better chance of you enjoying them. Prepare all of your veggies so that they are ready to go. Slice, dice, remove the corn from the cob. Cut the chicken breasts into pieces that are roughly the same size. You want about 8 pieces total. 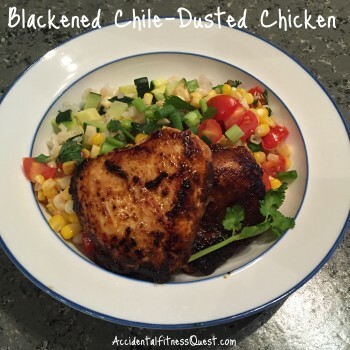 Coat the chicken pieces with the ancho chile powder. Heat a pan over medium heat and add the olive oil. As the pan heats, swirl the oil around to coat it. Add the chicken pieces to the pan. Cook the chicken over medium heat for about 5 minutes per side, until the spices blacken and the chicken is cooked thoroughly. While the chicken is cooking, combine the cooked rice, zucchini cubes, and 1 tsp of the minced garlic in a microwave safe bowl. Microwave for about 2 minutes until warmed and the zucchini is crisp tender, not mushy. Stir in 1 1/2 tsp of the lime juice and toss to mix. Once the chicken is done, remove it from the pan and cover to keep it warm. In the same pan used for the chicken, add the corn, tomatoes, remaining teaspoon of garlic, and onions. Cook stirring often for about 2 minutes until warmed. Remove from heat and stir in the cilantro and remaining 1 1/2 tsp lime juice. Divide the rice mixture evenly onto plates along with the corn mixture. Top with two pieces of chicken and garnish with extra cilantro and green onions, if desired. Makes 4 servings at approximately 343 calories – 28g protein, 33g carbs, and 11g fat.